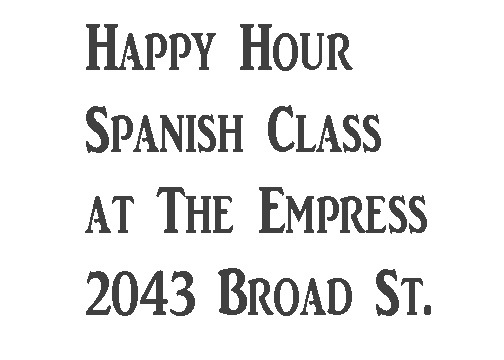 On Wednesdays at 6pm I’m going to be teaching a spanish class at The Empress. We’re calling it “Happy Hour Spanish”. For $10 you’ll get a Conversational Spanish for Beginners lesson and one of two beverage options. Feel free to order more on your own! The idea is that we’ll have fun, learn some conversational Spanish and enjoy drinks+ at The Empress. The class will be a weekly event for a while. Come try it! Me gusta. Deseo asistir pero yo vivo en Norfolk.